As I mentioned yesterday I tend to be a food monogamist. 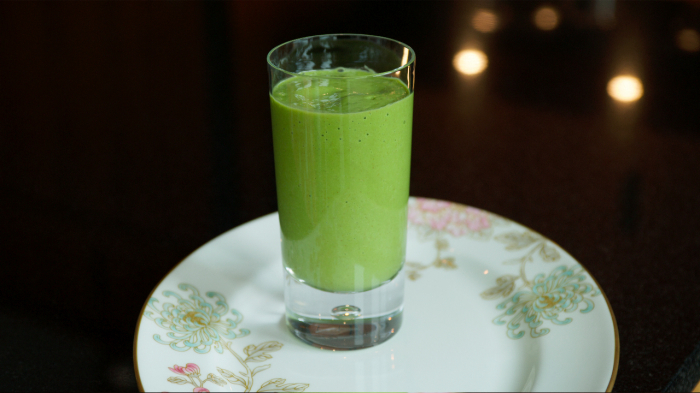 As with my salads, I will drink the same green smoothie everyday for weeks ( and weeks) at a time. A great smoothie is like the perfect pair of dark skinny jeans, it can be hard to break out of the box and try on something new. With the early onset of spring in NYC (loving it!) I have been trading in my perfect dark skinnies for this spring's pastels, florals, and neons. Like my denim, my greens are also getting a spring update! With the warm weather I am pulling away from my usual wintery kale and towards lighter greens such as arugula and romaine in my salads and smoothies. Adjust sweetness to taste and enjoy!